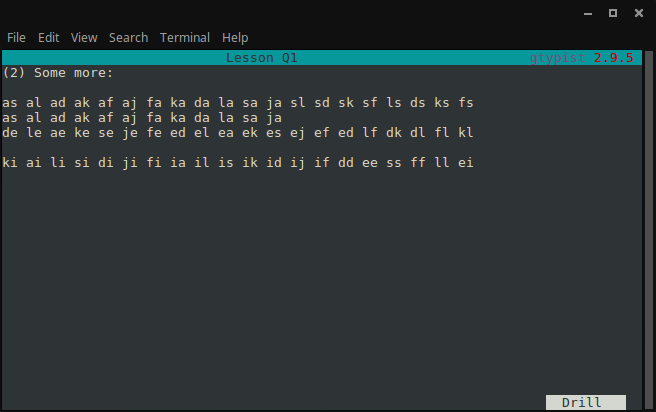 gtypist is a terminal-based typing tutor for Linux that helps improve your typing skills by offering short courses of varying difficulty levels. It is freely available from the Ubuntu repository. Use Synaptic or the command line to install. 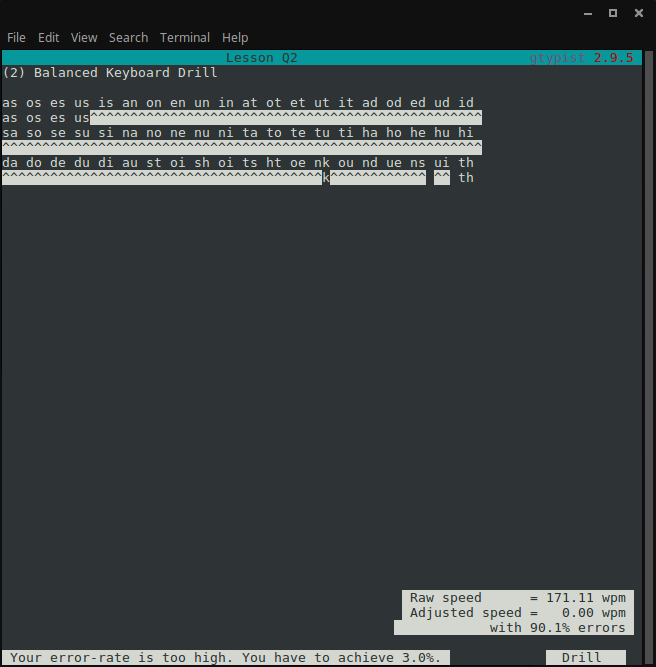 This article uses gtypist version 2.9.5 running in Linux Mint 18.2. 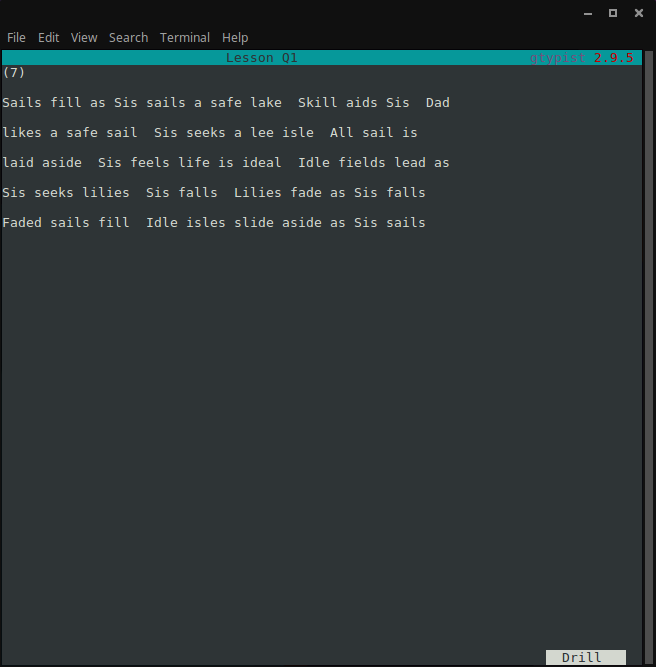 Run gtypist at the command line, and the main menu will appear. Select an option using the arrow keys on the keyboard. 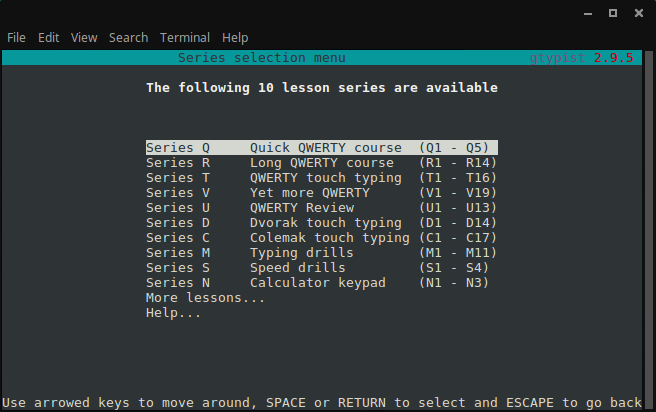 Qwerty and Dvorak lessons are available in addition to calculator numpad practice. A brief lesson is given for each course, so if you know nothing about how to type properly, then the friendly guide will assist. 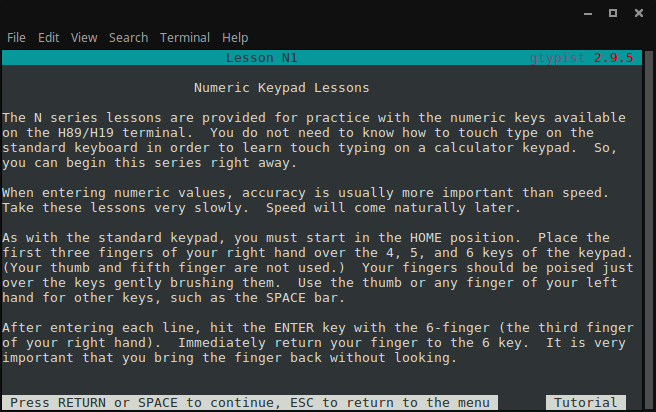 These instructions are for the numeric keypad course. 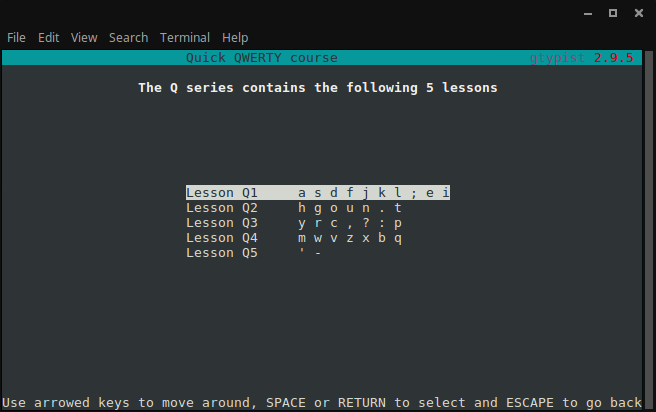 The quick qwerty course allows you to select which row to practice with. Again, brief advice for good typing habits. Remember, do not look at your hands when you type! If you have never typed before or would like to learn proper typing skills, gtypist guides you along the way. 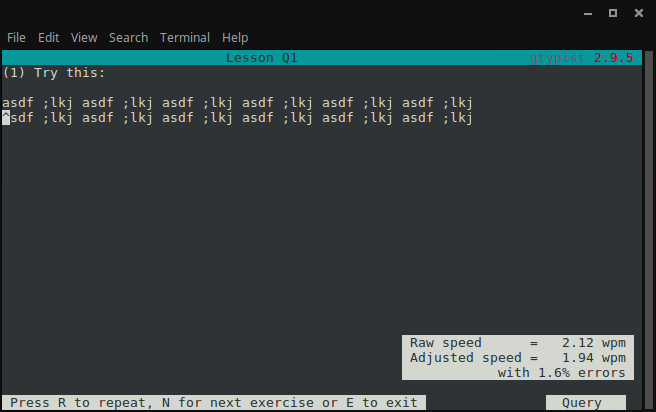 A series of typing drills help reinforce accuracy and flow. Errors are recorded, and you need a 3.0% or less accuracy rate to advance to the next lesson. Too many errors here, denoted by the carets, so it requires a redo until success. Typed text is enter below each character. Even though the beginning lessons present combinations of letters, as shown here, the focus of gtypist is practicing with real words. gtypist progresses to real words and sentences as quickly as possible since that is the goal of typing. Random characters are not the focus. 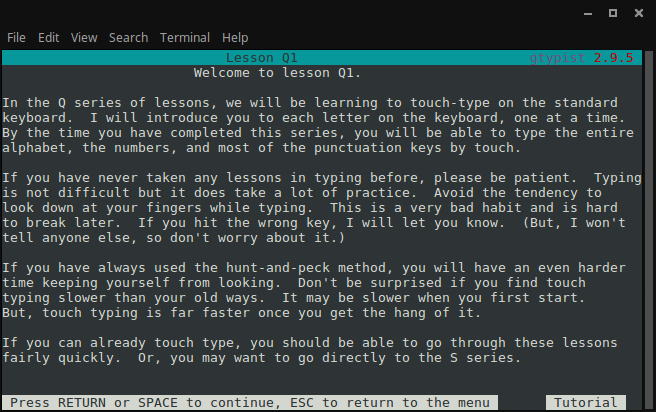 Be sure to read the man page for gtypist. 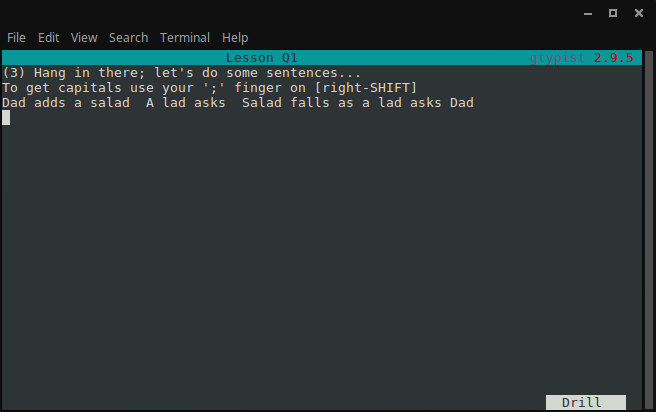 There are a number of command line options that allow customization. 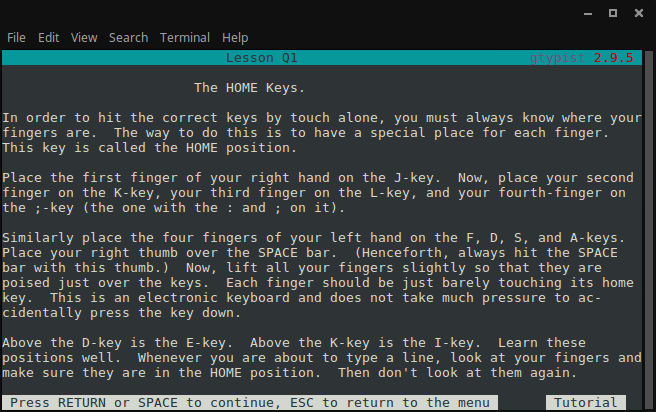 Proficient typing is an essential computer skill, and gtypist is another excellent Linux program to hone your finger magic. Do not let the terminal put you off. This is one of the better typing tutors due to its gentle progression through various courses while offering help and quick advancement into real-word sentences and words. This entry was posted on November 8, 2017, 3:51 PM and is filed under linux. You can follow any responses to this entry through RSS 2.0. You can leave a response, or trackback from your own site.